Intellectual property laws2 in Indonesia grant exclusive rights to intellectual property owners to exploit their intellectual property or to grant licences to other parties to exploit them. The licensing provisions of the intellectual property laws do not specifically regulate circumstances when the implementation of intellectual property can conflict with antitrust laws and regulations. The intellectual property laws in Indonesia only provide general provisions that licence agreements should not contain provisions that are directly or indirectly detrimental to the Indonesian economy, hinder the ability of Indonesian people to master and develop technology in general, or contradict Indonesian laws and regulations, morality and public order. The Anti-Monopoly Law3 of Indonesia generally covers the same ground as the competition law of other jurisdictions. It contains prohibitions against the usual forms of cartel behaviour, horizontal collusion and conspiracy, and also vertical restraints of trade and unilateral conduct (such as abuses of dominant position). The Anti-Monopoly Law is applicable to all businesses established in Indonesia or operating in Indonesia, whether or not they are legal entities. In Indonesia, intellectual property cases are tried by the commercial courts. The commercial courts' decisions may be subject to further appeal (by way of cassation) to the Supreme Court. Meanwhile, antitrust cases are tried by the Business Competition Supervisory Commission (KPPU), and the district courts and the Supreme Court are mandated to accept and try appeals against KPPU decisions. KPPU, which is the main enforcement body for the Anti-Monopoly Law, is an autonomous body, independent of the executive and judiciary legislative bodies, but its members are appointed by the president. KPPU is authorised to examine allegations of violations of the Anti-Monopoly Law, issue guidelines for implementation of the law and apply administrative sanctions, subject to court control. Article 50(b) of the Anti-Monopoly Law exempts agreements related to intellectual property (e.g., the licensing of intellectual property), trade secrets and franchising. The text of this Article does not include any qualification to this exemption. However, in its Guideline No. 2 of 2009 on the Exemption of Intellectual Property Agreements (the KPPU Guideline on the Exemption of Intellectual Property Agreements), KPPU has taken the position that this exemption is not absolute and that intellectual property licences are still subject to scrutiny under the Anti-Monopoly Law. KPPU assesses licence agreements under the rule of reason and will only exempt licences that do not cause monopolistic practices or unfair competition. In practice, when parties accused of violating the Anti-Monopoly Law try to invoke Article 50(b) in their defence, KPPU generally disagrees and does not accept that the exemption under this Article applies. Intellectual property licences are likely to become subject to increased competition law scrutiny as there is a draft revision to the Anti-Monopoly Law (the Draft Anti-Monopoly Law) that proposes eliminating the intellectual property licensing and franchising exemptions provided by Article 50(b). This draft is still being discussed by the Indonesian House of Representatives. At the current pace of discussion, it is not likely to become law until late 2018. If the proposal to eliminate this exemption is passed in its current form, it should become very clear that all intellectual property licences will have to comply with the Anti-Monopoly Law. Moreover, the Draft Anti-Monopoly Law is likely to increase the importance of antitrust concerns in intellectual property transactions. Transfers of assets (including intellectual property) that pass a certain threshold will become subject to merger review. Formations of joint ventures (including those that include contributions or the use of intellectual property) that pass a certain threshold will also be subject to merger review. In 2019, therefore, one may see a much greater interface between intellectual property and competition law in Indonesia, and potentially a greater interest being taken in intellectual property transactions by KPPU. No notable intellectual property-related cases have been tried by KPPU in the past year. As Indonesia is not a jurisprudence-based jurisdiction, prior court decisions do not need to be followed by panels of judges in similar cases. Moreover, the Draft Anti-Monopoly Law expands the criteria of transactions that are subject to merger review. Under the current law, only share transactions such as acquisitions and mergers are subject to merger review. Under this draft, asset acquisitions that pass a (yet to be determined) threshold will also be subject to merger review. This means whereas currently transfers of intellectual property are not subject to merger review, in the future they will be if the relevant thresholds are passed. Formation of joint ventures will also be subject to merger review under the Draft Anti-Monopoly Law. This means that intellectual property transactions arising from joint ventures such as parties agreeing to contribute intellectual property to a joint venture or agreeing on other arrangements involving intellectual property (e.g., common use of intellectual property, exclusive use of intellectual property) will be subject to review by KPPU. The Draft Anti-Monopoly Law also expands the definition of business actors to cover not only those who engage in business activities within Indonesia, but also those who engage in business activities outside Indonesia that affect the Indonesian economy. Taken together with the deletion of the exemption on licensing and franchising agreements, this means that if a licence agreement was concluded by overseas parties, those parties would become subject to penalty under the Anti-Monopoly Law if the agreement were found to be in violation of the Anti-Monopoly Law and affected the relevant market in Indonesia, even though the parties had no presence in Indonesia. According to the KPPU Guideline on the Exemption of Intellectual Property Agreements, the exemption provided by KPPU would only be applicable if the licence agreement was made in line with the intellectual property laws. According to intellectual property laws in Indonesia, intellectual property licence agreements must be recorded at the relevant intellectual property office to bind third parties. However, intellectual property owners have only been able to file recordal requests since the issuance of Minister of Law and Human Rights Regulation No. 8 of 2016 on Requirements and Procedures for the Recordal of Intellectual Property Licence Agreements on 24 February 2016. The purpose of the requirement to record intellectual property licence agreements is to bind third parties. From the perspective of third parties, recordal automatically serves as notification that there is an intellectual property licence arrangement in place between the intellectual property owner as the licensor and the licensee in Indonesia – which would be important if the intellectual property owner needed to show proof of use of its intellectual property in Indonesia. However, so far there have been no notable cases before the commercial courts where a licence agreement was overruled because of non-recordal issues. Moreover, KPPU has not issued any notable decisions in which it considered an intellectual property licence agreement as anticompetitive on the basis of non-recordal issues. Although the following discussion is based on the KPPU Guideline on the Exemption of Intellectual Property Agreements, in practice, KPPU guidelines do not restrain KPPU from adopting a different approach to particular cases if deemed necessary. So the views expressed in the Guideline might not reflect how KPPU will act in a particular case. As stated previously, the Anti-Monopoly Law exempts agreements related to intellectual property, but KPPU regards such exemptions as not being absolute, as a licence agreement would still be subject to the application of the Anti-Monopoly Law if it were to cause conditions of actual monopolistic practices or unfair business competition. As regards the Anti-Monopoly Law, business actors should not prevent other competitors from carrying out business activities in the same relevant market, or from carrying out development of technology, or prevent consumers from engaging in business relationships with competitors, as such conduct may lead to monopolistic practices or unfair business competition. According to the KPPU Guideline on the Exemption of Intellectual Property Agreements, intellectual property licence agreements may be subject to the application of the Anti-Monopoly Law if (1) the intellectual property is deemed as an essential facility and the owner refuses to license it, or (2) the licence agreement leads to exclusive dealing. The KPPU Guideline on the Exemption of Intellectual Property Agreements provides some examples where licence agreements may lead to exclusive dealing, such as pooling licensing and cross-licensing, tying arrangements, material supply limitation, production and marketing limitation and grant-back licensing. According to this Guideline, it should be identified whether the licensed intellectual property is deemed as an essential facility. An essential facility in general is a facility that is required to run a business and not economical to duplicate. Specifically in relation to franchise agreements, according to KPPU Guideline No. 2 of 2009 on Exemption of Franchise Agreements (the KPPU Franchise Guideline), a franchise agreement cannot be exempted from the application of the Anti-Monopoly Law if it consists of provisions relating to purchase obligations or unrelated to the intellectual property that is the essence of the franchise business or that cause entry barriers for other suppliers. the recipient of any product or service will get certain prices or discounts, but in return it is required to purchase other products or services from the supplier or the recipient is prohibited to purchase the same type of products or services from the supplier's competitors. Article 15 of the Anti-Monopoly Law provides that a prohibition on exclusive dealing is illegal per se, but the KPPU guidelines indicate that this should be subject to the 'rule of reason', specifically prohibiting the practice if it has caused or might cause monopolistic practices or unfair competition. The intellectual property laws do not specifically regulate grant-back licences. Nevertheless, according to the KPPU Guideline on the Exemption of Intellectual Property Agreements, each party should consider the fact that a grant-back licence may hinder the licensee from advancing the technology. The grant-back licence may also be unfair, as it allows the licensor to own intellectual property that it has not created itself. Therefore, this provision could be seen as anticompetitive and, hence, it may be further examined for potential violation of the Anti-Monopoly Law, with consideration given to the background, purpose and reasons for the inclusion of the grant-back provision in the licence agreement. As explained earlier, that assessment should also consider whether the licensed intellectual property is deemed as an essential facility. In general, if the intellectual property is not deemed as an essential facility, the exemption could be applicable. a patent resulting from a development of a previous patent cannot be implemented without using a third-party patent that is still under protection. To obtain the compulsory licence, the applicant (or its proxy) should also provide evidence that it has taken actions within 12 months after the first action to obtain a licence from the patent holder based on proper requirements and conditions, but that it was not successful. The Minister of Law and Human Rights can only grant a compulsory licence if the Minister is of the opinion that the aforementioned patent can be implemented in Indonesia on a 'proper economic scale' and can benefit society.7 'Proper economic scale' is regarded as circumstances in which the products manufactured using the patent could be sold at an affordable price to the public while still taking the rights of the patent holder into consideration. As stated earlier, the refusal of a dominant business actor in a relevant market to license intellectual property could constitute a prohibited relative monopolistic practice. civil liability: subject to an order to cease the abuse of the dominant position and fines of between 1 billion rupiah and 25 billion rupiah, and damages. Patent pooling takes the form of an agreement between multiple patent holders to license their patent to a third party. In general, the Patent Law does not specifically regulate patent pooling issues. Nevertheless, from the perspective of the KPPU Guideline on the Exemption of Intellectual Property Agreements, the Anti-Monopoly Law could still be applicable to patent pooling arrangements, subject to the rule of reason. Specifically, the Guideline provides that if the pooling of a licence consists of provisions allowing manufacturing or marketing activities of a product dominantly owned by one business entity such that other business entities could not compete effectively, those provisions could be seen as anticompetitive. For example, those kinds of monopolistic practices could be applied by setting discriminatory pricing for other business actors outside the patent pool and limiting the grant of licences to those outside the pool. With regard to trademark licensing, the licensors' perspective is usually that it would be essential for them to control the use and commercial exploitation of their marks by licensees, and ensure that this use does not conflict with the licensors' business and interests. For example, in a franchise business, the licensors may request the licensees to purchase materials from a certain supplier. According to the KPPU Franchise Guideline, such an arrangement could be exempted from the application of the Anti-Monopoly Law, as long as it is related to the intellectual property that is the essence of the franchise business, or would not cause entry barriers for other suppliers. In some jurisdictions, competition issues relating to trademark licensing may also arise in the form of coexistence agreements when both the licensor and licensee decide to regulate each party's use and registration of its marks to avoid confusion among consumers. In general, the Trademark Law and also the Indonesian Trademark Office's practice do not acknowledge coexistence agreements. Therefore, while coexistence agreements may be considered binding between parties from a contractual perspective, coexistence agreements may not be used to overcome possible rejections of trademark by the Indonesian Trademark Office. The Anti-Competition Law also does not specifically regulate the coexistence-agreement issue. As a general rule, however, coexistence agreements should not limit competitors' ability to carry out their business activities in the same relevant market or prevent consumers from doing business with competitors, as such terms may be monopolistic and anticompetitive. In general, the patent for an invention that is integral to standards that are important for functionality or for relevant commercial items is known as a standard-essential patent (SEP). This is mostly relevant in the information and communication technologies sector, where creation and protection of new communication standards through patents could constitute a competitive advantage that allows an SEP holder to control input and hinder the entry of potential competitors or innovation in the market. The Patent Law does not specifically define or regulate SEPs, although it provides a mechanism for third parties to seek a compulsory licence for implementing a patent resulting from a development of a previous third party's patent that is still under protection, as stated above. Moreover, under the Patent Law and the Anti-Monopoly Law, holding an SEP has not been found to directly yield dominance in the patent-related market. Furthermore, there have been no KPPU decisions issued in recent years finding refusal to license an SEP as being anticompetitive. There have been no KPPU decisions analysing injunctions sought by patent holders from the antitrust perspective, as there is currently no measure for injunctions under the Anti-Monopoly Law. As a general rule, the Patent Law provides a mechanism for the owner of a patent registration to file a request for an injunction (in the form of a temporary court order) to prevent: (1) the entry to the market of products resulting from patent infringement; (2) the removal of the evidence of patent infringement from the infringer's premises; and (3) further damage being suffered by the patent owner.11 The mechanisms to initiate a temporary court order are stipulated in Supreme Court Regulation No. 5 of 2012 on Temporary Court Orders (Regulation 5/2012). According to Regulation 5/2012, the court order request should be lodged together with the payment of a deposit or warranty in an amount equal to the value of the suspended goods. With regard to the process, within two days of the court order request being lodged, the commercial court should decide whether to grant or reject the request. If the request is granted, the bailiffs will go to the defendant's premises to initiate the order. Within 30 days of the implementation of the court order, the panel of judges should review the case (hearing arguments from both parties) and accordingly decide either to confirm or cancel the order. If the panel of judges confirms the order, the plaintiff should proceed with filing an infringement claim as a follow-up. If the panel of judges cancels the order, the deposit or warranty will be given to the defendant. According to Regulation 5/2012, the amount of the deposit for the temporary court order should be equivalent to the value of the goods detailed and the costs that will be incurred as a result of the implementation of the court order.12 Unfortunately, at the time of writing, the implementation of this measure is yet to be tested, as there is no further guideline available for the commercial courts to calculate the deposits or warranties for temporary court orders; hence, there have been no court orders requested for patent infringement cases so far. The Patent Law does not include any provisions that require an SEP holder to grant patent licences to other parties under FRAND licensing terms. There have been no notable court cases in Indonesia in relation to the application of FRAND licensing terms, particularly those cases where patent licence agreements are overruled or deemed invalid because of failure to comply with FRAND licensing terms. There are no specific provisions in the Patent Law prohibiting issues such as exploitative prices and practices, or exclusionary practices. Moreover, there has been no notable intellectual property or antitrust case where royalty rates in an intellectual property licence agreement are deemed as abusive or excessive. As best practice, any applicable industry-specific guideline should also be taken into consideration when determining royalty rates. For example, in the music industry, the Minister of Law and Human Rights has issued Decree No. HKI.2.OT.03.01-02 of 2016 to regulate the benchmark for royalties for the use of music by various users or premises in Indonesia. Currently, a transfer of IP rights is not subject to merger review and does not constitute a merger. That said, as discussed earlier, the Draft Anti-Monopoly Law proposes to include transfers of assets and the establishment of joint ventures that meet certain thresholds (to be determined in an implementation regulation) as transactions subject to merger review. In relation to this, KPPU must complete the merger review within 25 working days.13 This requirement could be important and should be taken into consideration for transactions involving acquisitions of intellectual property after the Draft Anti-Monopoly Law is passed. In relation to the post-completion notification as elaborated above, if KPPU determines that a transaction may cause monopolistic practices or unfair competition, KPPU Guideline No. 10 of 2011 on Mergers (the KPPU Merger Guideline) provides a procedure that allows the acquiring entity to propose remedies. According to the KPPU Merger Guideline, the proposed remedies can be in the form of behavioural remedies relating to intellectual property. If KPPU accepts the proposed remedies, it will issue a conditional opinion of no risk of monopolistic practices or unfair competition. If KPPU rejects the proposed remedies, it will issue an opinion that the transaction risks causing monopolistic practices or unfair business competition. Nevertheless, we are not aware of any mergers where KPPU has imposed remedies involving the transfer of intellectual property to prevent a business entity achieving a dominant position by such means. As noted, the above discussion applies to the current merger review regime, the application of which is limited to acquisitions of shares, and mergers and consolidations between companies. It remains to be seen whether a new more specific remedy regime will be applied to transfers of assets, in particular those involving transfers of intellectual property when the Draft Anti-Monopoly Law comes into force. This concept is not commonly known in Indonesia, as there have been no notable cases analysing the antitrust implications of sham or vexatious IP litigation. While 'pay for delay' has been a hot issue in other jurisdictions, there have been no notable patent-related cases before the commercial courts where pay for delay was one of the measures to settle the court dispute. In general, the number of patent infringement cases in Indonesia is not significant, compared with other intellectual property infringement cases such as trademark or copyright infringement. The Patent Law does not specifically define 'sham litigation', but it is normal in Indonesian court practice that infringers respond to infringement claims by saying that the civil claim was groundless or unclear. This defence is usually raised together with the arguments that the intellectual property being used by the infringer is not the same as the one owned by the plaintiff; hence, the commercial use is non-infringing. In some jurisdictions, this topic may lead to 'evergreening' issues in the pharmaceutical and healthcare industry, which is considered a life-cycle strategy initiated by patent holders to extend products that are about to expire to retain patent royalties. This is not a concept normally regulated under the Patent Law, and in general there have been no notable cases where KPPU considered evergreening or life-cycle management measures initiated by patent holders as anticompetitive. Moreover, at the time of writing, there have been no patent infringement cases before the commercial courts where the panel of judges highlighted misuse of the patent process. On a related note, the Patent Law provides five years (two years under the previous law) for third parties to use a patented invention for the purpose of carrying out tests, preparing for production and seeking regulatory or marketing approval before the patent expires (widely known as the Bolar provision). So far, there have been no notable cases where KPPU reviewed the settlements of intellectual property disputes from antitrust perspectives. 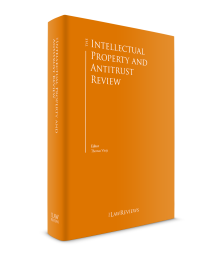 The development at the interface between intellectual property and antitrust law has not been very dynamic in recent years. That said, we would expect a greater degree of dynamism once the Draft Anti-Monopoly Law is passed, as the exemptions for intellectual property-related agreements will be set aside, and asset transactions and joint-venture transactions involving intellectual property will be subject to KPPU review. 1 Daru Lukiantono is a senior partner, Mochamad Fachri is an associate partner and Wiku Anindito is a senior associate at Hadiputranto, Hadinoto & Partners. 2 Law No. 20 of 2016 on Trademarks (the Trademark Law), Law No. 13 of 2016 on Patent (the Patent Law), Law No. 31 of 2000 on Industrial Design (the Industrial Design Law), Law No. 28 of 2014 on Copyright (the Copyright Law), Law No. 30 of 2000 on Trade Secret (the Trade Secret Law), Law No. 29 of 2000 on Plant Variety Protection (the Plant Variety Protection Law) and Law No. 32 of 2000 on Integrated Design Circuit Layout (the Integrated Design Circuit Layout Law). 3 Law No. 5 of 1999 on Prohibition of Monopolistic Practices and Unfair Business Competition. 4 Article 25(2) of the Anti-Monopoly Law. 5 Article 1(4) of the Anti-Monopoly Law. 6 Article 84(1)(a) of the Patent Law. 7 Article 84(1)(c) of the Patent Law. 8 Article 80(2) of the Copyright Law. 9 Article 80(3) of the Copyright Law. 10 Article 82(3) of the Copyright Law. 11 Article 155 of the Patent Law. 12 Article 2 of Regulation 5/2012. 13 Article 62 of the Draft Anti-Monopoly Law.